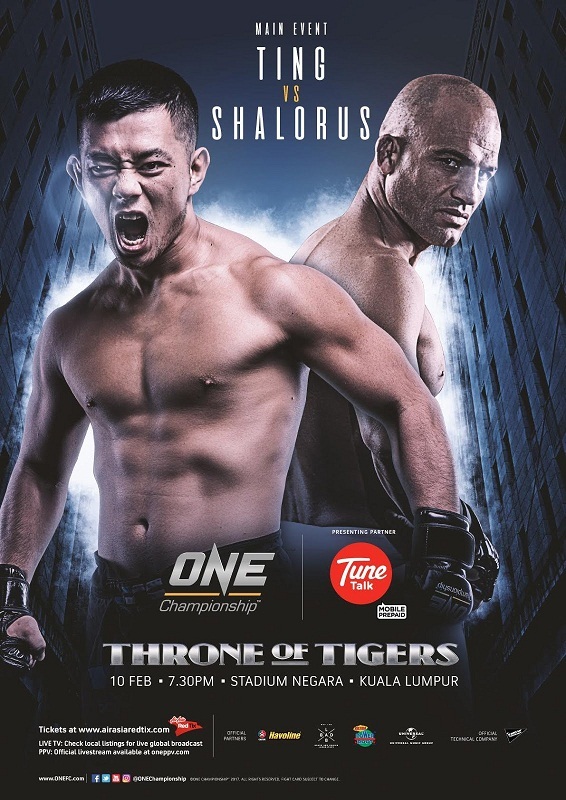 12 January 2017 – Kuala, Lumpur: The largest sports media property in Asian history, ONE Championship™ (ONE), in partnership with Tune Talk, has just announced additional bouts to complete a spectacular card at ONE: THRONE OF TIGERS. The blockbuster event will feature the absolute best in local and international mixed martial arts talent, accentuating a tremendous main event bout between hometown hero Ev “E.T.” Ting and lightweight veteran Kamal Shalorus. The undefeated Agilan “Alligator” Thani of Kuala Lumpur, Malaysia, will be making his return to the ONE Championship cage, following his spectacular submission victory over hard-hitting Filipino fighter Trestle Tan in September 2016. The 21-year old prospect is a perfect 6-0 as a professional, with five of his six victories ending in the first round. Thani has shown steady improvement in each outing, and will look to put his skills further to the test against Chinese Taipei’s Jeff Huang. Jeff “The Machine” Huang is Chinese Taipei’s top welterweight, and he cemented that standing when he knocked out Indian kickboxer Bala Shetty in his ONE Championship debut. Despite having a comfortable career as a financial consultant, Huang elected to give it up to follow his passion and dedicate himself to mixed martial arts. Huang spent his life savings to travel the world and pick up new techniques, studying various fight disciplines. In his most recent bout, Huang finished Filipino fighter Trestle Tan with a furious punching combination to earn a scintillating first-round TKO. All six of Huang’s victories so far have ended in spectacular fashion. He will do battle with Malaysian prospect Agilan Thani next. 30-year-old Ann “Athena” Osman of Kota Kinabalu is Malaysia’s premier women’s combat sports star. Training out of the coastal locale of Sabah, the female warrior hones her craft at Borneo Tribal Squad, advancing her skills in various disciplines such as wrestling, Brazilian jiu-jitsu, and Muay Thai. A well-rounded mixed martial artist, Osman likes to overpower her opponents and is extremely aggressive, always looking for the finish. Osman will take on Cambodia’s Vy Srey Khouch in her return to the ONE Championship cage. Vy Srey Khouch is a highly-regarded Cambodian female boxer who competed in numerous international competitions. She made her professional mixed martial arts debut in 2015, winning by decision at ONE: KINGDOM OF KHMER. Srey Kouch is currently unbeaten and riding a two-fight win streak. In her next bout, she will take on the gargantuan task of handling Malaysian women’s MMA standout, Ann Osman. 28-year-old Herbert “The Blaze” Burns of Rio de Janeiro, Brazil, is one of the most talented featherweights in ONE Championship. The grappling specialist has a penchant for locking in fight-ending submissions, and is a legitimate threat to any opponent on the mat. In his last bout, Burns submitted the hard-hitting Timofey Nastyukhin with a first-round rear-naked choke. With his strong background in Brazilian jiu-jitsu, Burns is widely considered as one of the top contenders in his division. He squares off with Russian combatant Movlid Khaibulaev next. 26-year-old Movlid “Killer” Khaibulaev is currently undefeated with an immaculate 10-0 professional record, and is a mixed martial artist from Russia. Half of his victories have come by finish, including one submission and four emphatic knockouts. Having spent the majority of his career competing in his home country, Khaibulaev now makes his debut in Asia by putting his unblemished win-loss slate on the line against fellow undefeated standout Herbert Burns. 22-year-old Keanu Subba of Kuala Lumpur, Malaysia, is a former amateur MMA standout and one of the most promising young talents in ONE Championship’s featherweight ranks. He is 4-2 as a professional mixed martial artist after making a name for himself as the former MIMMA featherweight champion. Subba’s experience inside the ONE Championship cage as a young fighter has taught him great lessons that he says has helped him improve his overall game. He’ll get the chance to test those skills against fast-rising Ahmed Mujtaba next. Ahmed “The Wolverine” Mujtaba is a Pakistani mixed martial artist competing in ONE Championship’s stacked featherweight division. He owns a perfect professional record of six wins and no losses, with 83% of his wins coming by spectacular finish. He is known for his tremendous grappling technique which has led to four submissions out of six total victories. Mujtaba makes his second ONE Championship appearance against local Malaysian hero Keanu Subba. Roy Doliguez is a Filipino mixed martial artist currently riding a 6-3 record. Considered one of the best strawweights in Asia, Doliguez is also a former professional boxer with more than 40 pro bouts. He made his promotional debut in 2015, vying for the inaugural ONE Strawweight World Championship against Dejdamrong Sor Amnuaysirichoke. The 34-year-old native of Sarangani, Philippines, makes his return to the ONE Championship cage against Brazil’s Alex Silva. 33-year-old Alex “Little Rock” Silva of Brazil is a mixed martial artist who holds a record of 4-1 as a professional, and is riding high on a three-fight winning streak. He is a Brazilian jiu-jitsu specialist with a terrifying ground game and knack for securing highlight-reel submission finishes. With steadily increasing confidence, Silva’s last three victories have ended in spectacular first-round submissions. He takes on former world title challenger Roy Doliguez next. Saiful “The Vampire” Merican of Kuala Lumpur, Malaysia, is happy to compete in front of his hometown crowd in Kuala Lumpur once again. The 28-year old flyweight combatant is an explosive striker who starts bouts fast, always looking to end matters early. He has had incredible success inside the ONE Championship cage with his fan-friendly fighting style. Merican is now looking to open 2017 with a bang by defeating Filipino fighter Burn Soriano. Burn “The Hitman” Soriano of Ilocos Sur, Philippines, is coming off a highlight-reel victory over Indonesia’s Mario Sitya Wirawan, scoring a lightning quick 15-second spinning back fist KO. With a professional mixed martial arts record of 3-2 which includes two wins by submission and one by knockout, Soriano looks to continue his winning ways inside the ONE Championship cage. In his next bout, Soriano goes head-to-head with Malaysian MMA hero Saiful Merican. 26-year-old Tiffany “Soul Crusher” Teo is a female mixed martial artist who competes in ONE Championship’s women’s flyweight division. She holds an unblemished professional record of four wins and no losses, including two submissions and two knockouts. Born in Brunei and raised in Singapore, Teo began training in taekwondo before moving on to compete in boxing & Muay Thai and eventually transitioning to MMA. Teo is set to make her second appearance inside the ONE Championship cage against Priscilla Hertati Lumban Gaol. Indonesian female fighter Priscilla Hertati Lumban Gaol is a striker who has trained in various standing disciplines such as kickboxing and wushu. She makes her ONE Championship debut at ONE: THRONE OF TIGERS, joining a growing list of elite female MMA talent in Asia. Gaol will look to emerge triumphant in her first appearance inside the ONE Championship cage, but will have to go through Singaporean prospect Tiffany Teo to earn the victory. Kicking off an exciting fight card at ONE: THRONE OF TIGERS, former MIMMA featherweight champion Muhammad Aiman of Malaysia will do battle against grappling ace Eduardo Novaes. The 21-year-old Aiman is 1-1 as a professional mixed martial artist and will be put to the test against Novaes, who is making his ONE Championship promotional debut. For more updates on ONE Championship, please visit www.onefc.com, follow us on Twitter and Instagram @ONEChampionship, and like us on Facebook athttps://www.facebook.com/ ONEChampionship.